This is my most favourite place – Challaborough Bay in Devon. It is a Parkdean caravan park right on the beach and oh my what a beautiful beach it is. I call it my happy place. We first visited Challaborough Bay when I was around 34 weeks pregnant with Little Man. We were looking for a quiet, sunny beach holiday in the UK to spend some time together before our little man arrived. It was the perfect setting for this, the slower pace of life took over and we spent a chilled out week in a beautiful part of the country. We visited again the following year for Little Man’s first holiday, we came back knowing that we would have everything we needed with a 10 month baby in tow and loved it even more. We spent another gorgeous week there and had even better weather. Little Man loved being in the caravan and this was also his first experience of the seaside. We hope to visit again in the next year or so to create even more memories at this wonderful place. 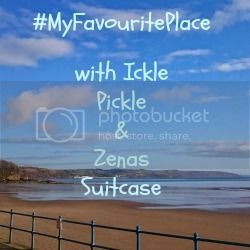 This post was inspired by Ickle Pickle’s & Zenas Suitcase’s linky #MyFavouritePlace, you can find more information about it here. Oh I’d love to live by the sea, I did for a while at uni and miss being able to see the sea everyday. Thanks for commenting. Great linky.